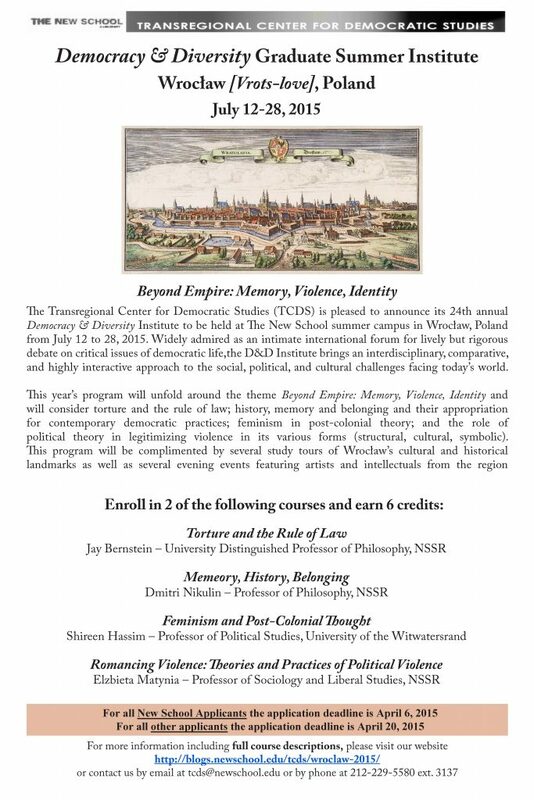 The Transregional Center for Democratic Studies (TCDS) is pleased to announce its 24th annualDemocracy & Diversity Institute to be held at The New School summer campus in Wrocław, Poland from July 12 to 28, 2015. Over the years the D&D Institute has gathered an exceptional international reputation as a major transatlantic bridge that brings Americans and Europeans closer to ideas generated in both parts of the world. Widely admired as an intimate international forum for lively but rigorous debate on critical issues of democratic life, the D&D Institute brings an interdisciplinary, comparative, and highly interactive approach to the social, political, and cultural challenges facing today’s world. Located between Berlin, Prague, and Warsaw, and saturated with the history and memory of these three distinct cultures, Wrocław (formerly Breslau) is a beautiful and booming city that uniquely conveys both the challenges and the promise of a united Europe. Drawing on Wrocław’s culture of the borderland, TCDS’s network of distinguished and dedicated collaborators and alumni, and The New School’s reputation stemming from our long-term engagement in the region, the Democracy & Diversity Institute offers a rigorous program of critical inquiry on some of the most pressing problems of our time. This year’s program will unfold around the theme Beyond Empire: Memory, Violence, Identity and will consider torture and the rule of law; history, memory and belonging and their appropriation for contemporary democratic practices; feminism in post-colonial theory; and the role of political theory in legitimizing violence in its various forms (structural, cultural, symbolic). This program will be complimented by several study tours of Wrocław’s cultural and historical landmarks as well as several evening events featuring artists and intellectuals from the region. Our local collaborators in Poland are the International Institute for the Study of Culture and Education (IISCE) at the University of Lower Silesia and the Ośrodek Szkolenia Państwowej Inspekcji Pracy. The goal of this seminar is to begin the defense of two apparently unrelated theses: that torture should be regarded as always and absolutely legally impermissible; and that the rule of law is not merely a legal ideal, but, rather, should be considered as belonging to the very idea of law. Treating the rule of law – the idea that no one is above the law, and that all law should be governed by procedural due process considerations that lead to legal certainty, predictability, and settlement – as intrinsic to legality radically opposes the now dominant views of legal positivism. The connection between the two ideas is historical and conceptual: the robust idea of the rule of law first emerged in the eighteenth century, in Beccaria’s On Crimes and Punishments, as what was legally necessary in order to overcome the pervasive use of judicial and penal torture then common in Europe. On this interpretation, the rule of law is the institutional basis of human dignity, and the abolition of torture the lynchpin of modern political morality. The seminar will examine the ferocious current debate about the use of torture in states of emergency, Foucault’s account of the abolition of torture in Discipline and Punish, Beccaria’s little treatise, Jeremy Waldron’s and connected writings on torture, and relevant works on the rule of law itself including Lon’s Fuller’s The Morality of Law. In this course, we will discuss the role that memory plays in the constitution of historical narratives and the sense of personal and collective belonging that results from these narratives. We will address a variety of topics at the intersection of history, memory and belonging and trace their appropriation for contemporary democratic practices. Among these topics are: the constitution of individual, collective, and cultural memory, their mutual relation and recognitional structure, the freedom of speech, the (im)possibility of universal history, paradoxes and ambiguities of history, repressed memory in history, and memory and trauma. Readings will include: Aristotle, Nietzsche, Foucault, Maurice Halbwachs, Pierre Nora, Jan Assmann, Reinhardt Koselleck, Jacque LeGoff, Ross Poole, Michael Rothberg, Ruth Leys, and Axel Honneth. Feminism has been implicated in processes of defining a western norm and reproducing singularities of women in the east and the south, as if the specific histories of those regions are secondary to theoretical and political projects of equality. Postcolonial feminism begins from the recognition that struggles of women in the south for freedom are not merely simulacra of the struggles of white women in the west, and proposes that processes of economic, political and social change be treated as connected across regions. In this course we explore the genealogies of postcolonial feminism beginning with Gayatri Spivak’s paradigm-shifting article “Can the subaltern speak?” We focus on debates about empire, coloniality, and race in a variety of contexts from India to sub-Saharan Africa to the United States. We address the question of whether feminist concepts developed on the basis of western experiences ‘travel’ by focusing on postcolonial African and Indian contexts. Then, taking seriously the injunction to encompass relationships across the globe – established through colonialism, migration, and war — we ask ‘how does postcolonial feminism define the West’s “others”?’ In this part of the course we will look at the tensions between feminism in the United States and western Europe on the one hand, and in East and Central Europe on the other. Finally, we will explore ways in which tensions between universality and particularity bedevil contemporary debates about representation and multiculturalism. Given measurable success in recent decades in the creation of both a political culture and political mechanisms to bring about the end of military dictatorships and a peaceful dismantling of oppressive regimes, how is it that the original sin of politics, namely the use of force and violence, seems to be enjoying a spectacular rebound? How to read the newly bourgeoning sources, forms, and targets of violence? To what extent are they transforming the world as we know it? While exploring classical propositions concerning the role of violence in bringing about social and political change – from Marx, through Weber, Lenin, Gramsci, Arendt, and Benjamin, to more recent thinkers such as Foucault, Derrida, Zizek, and Michnik – we will look at different types of political violence and its specific instances, and revisit Arendt’s well-known distinction between the justifiability and the legitimacy of violence. Conscious of the traditional forms of political violence – wars, revolutions, and armed-struggle movements – we will pay particular attention to the forms and consequences of structural violence, but also examine the forms of cultural and symbolic violence that routinely serve to legitimize violence. Using historical, but also hermeneutical and phenomenological approaches, we will explore ideas, practices, and events generated in different parts of the world, with an emphasis on Europe, Latin America, and Southern Africa. The Institute participants will be housed in The Park Hotel of the Ośrodek Szkolenia Panstwowej Inspekcji Pracy conference center conveniently located amidst the beautiful Szczytnicki Park about a 30-40 minute walk to the city historical center and close to the iconic Centennial Hall. The hotel’s unique building, which was designed in 1929 by the prominent modernist architect Hans Scharoun (1893-1972), features the principle of organic architecture promoting harmony between human habitation and the natural world. The participants will share double and triple rooms in the modernist residence and classes will be held in the next-door conference center. Breakfast and lunch will be served in the hotel. Graduate applicants: Applicants should have completed their undergraduate studies by the time of the Institute and should be either enrolled in a postgraduate degree program or working as junior university teachers or researchers. Preference will be given to those applicants who can demonstrate active involvement in civil society and civic life. Advanced undergraduate applicants: Applicants must be enrolled as juniors or seniors. Preference will be given to those applicants who, while academically inclined, can demonstrate an active interest in civic life. Tuition: Tuition for applicants from The New School is based on the tuition they pay at their respective home divisions. New School financial aid is applicable. Please contact the Office of Financial Aid for more information. Program Fee: The program fee of $2000 covers participants’ room and partial board (breakfast and lunch) for the duration of the Institute, as well as the cultural program of lectures, tours, opening and closing receptions, etc. Travel costs are not included. Successful applicants can apply for support in their respective divisions. New School for Social Research (NSSR) students may apply directly to TCDS for support in covering the program fee. We encourage all applicants to look for outside funding sources. Program Fee: The program fee of the 2015 Graduate Summer Institute for non-New School students is $2500, covering tuition (non-credit), room and partial board (breakfast and lunch), and the cultural program of lectures, tours, opening and closing receptions, etc. Travel costs are not included. We strongly encourage all applicants to look for funding sources from their home institutions and local organizations. Please view the application instructions and download the application form here. ~Applicants from The New School except for Eugene Lang College: Please submit application materials to TCDS via e-mail: tcds@newschool.edu with the subject “WR15 Application.”tcds@newschool.edu You can also submit your application in person at TCDS, 80 Fifth Ave, 5th Floor, Room#517, NY, NY 10011. ~Applicants from Eugene Lang College: Please submit application materials to Dechen Albero, Senior Academic Advisor at Eugene Lang College Study Abroad by e-mail: Langstudyabroad@newschool.eduwith the subject “WR15 Application.” You can also submit your application in person at Study Abroad, 64 W 11th St, New York, NY, tel: 212.229.5100 x2260. ~Applicants from Poland: All applicants from Poland should apply through the International Institute for the Study of Culture and Education (IISCE) at the University of Lower Silesia. Please submit application materials via e-mail: iisce@dsw.edu.pl with the subject “WR15 Application”; or via fax: +48 71 356 15 72. ~All other Applicants: Please submit application materials to TCDS via e-mail: tcds@newschool.eduwith the subject “WR15 Application.”tcds@newschool.edu You can also send your application by mail to The Transregional Center for Democratic Studies (TCDS), 80 Fifth Ave, 5th Floor, Room#517, NY, NY 10011. For all New School applicants, the application deadline is April 6, 2015. For all other applicants, the application deadline is April 20, 2015.
contact us by e-mail at tcds@newschool.edu or by phone at 212 229-5580 ext. 3137. ← TCDS Announces 24th Annual Democracy & Diversity Institute in Wroclaw, Poland, July 12-28, 2015!